If it were up to us, we'd pretty much wear sneakers 24/7 (excluding time spent sleeping, of course). They're comfy, cool, and ideal for anyone who's constantly on the run. Still, not all styles are created equal. Through trial and error, we've come to find that certain pairs are better-suited to a very specific task. Yes, you can wear sneakers every day, but it does matter which pair you opt for. Below we're breaking it down by four occasions: work, errands, workout, and dress-up. So whether you're kicking back on the weekend or walking into an important meeting, you'll feel sure-footed. Read on for a breakdown of the best sneakers for every occasion; then shop our picks! Sneakers may not be the obvious choice when it comes to dressing for a date or dinner with your girlfriends, but a pair with a little something special are not only just as cute as a pair of heels, they're undeniably more comfortable. Look for styles with luxe fabrics, lifted soles, or embellished details, and you'll be good to go. A platform or wedge base add height, like a pair of heels, but without the pain. Luxe materials like satin make sneakers feel especially different and extra special. If you're looking to stand out at a fun function, choose sneakers with a little sparkle or unique details. When the weekend rolls around and you've got a Saturday ahead of you with a random smattering of errands but nothing big to do, it's your time to bust out a pair of trendy kicks. These cool sneakers should impress the old flame you're bound to run into while you're out and about (because that's what always happens, right?). They're a little bolder than what you might wear to work, and while you can run errands in them, if you want to wear them to brunch, they'll set you apart too. You'll be the coolest girl grabbing groceries in these trendy shoes. An of-the-moment brand like Gucci is ideal when you're putting together a "casual" weekend outfit but you still want to impress. Opt for a fashion-forward spin on classic trainers by investing in a pair with standout details. The topic of sneakers in the office is one that manages to spark debate, but for even more conservative offices, there are definitely styles more likely to fly. If you're planning on wearing a pair to work, opt for something sleek, simple, and polished. The sneakers below look cool but won't ruffle too many feathers. When you're at work, a simple pair of lace-ups won't attract too much attention. These pointed street shoes seem to fall somewhere between sneakers and flats, making them feel better suited for work. When in doubt, stick to the classics like these Adidas Superstars. Whether you've got a weekly Barry's class on the calendar or you just like to rock the athleisure trend from your couch at home, workout sneakers are the ultimate statement piece. Comfort is, of course, the most important thing, but bright colors, bold patterns, and creative cuts are also worthy of your attention. If you're all about keeping workout gear low-key, sleek black sneakers look great with leggings. A cushioned, comfy pair of athletic sneakers can survive a run or an hour in the weight room. These sneakers are all about bringing out your inner competitor and giving you a leg up on the competition when it comes to style. Need more sneaker inspiration? 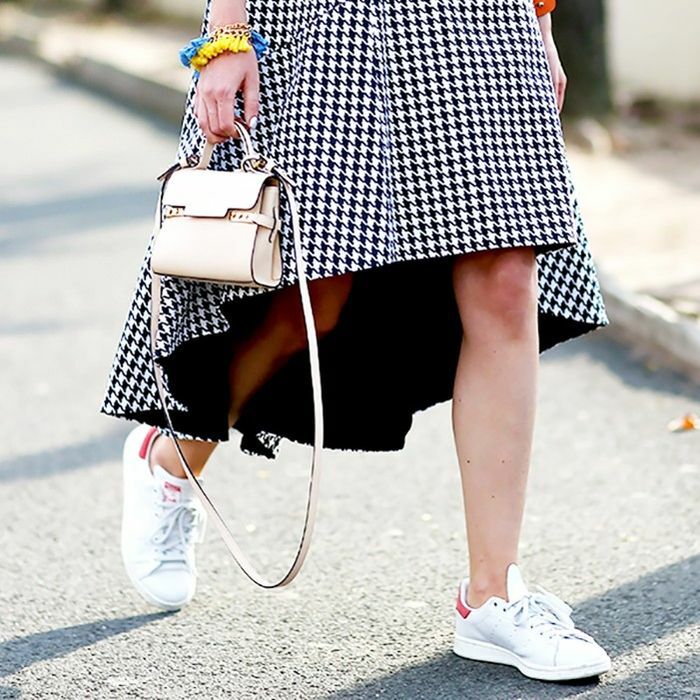 These are the best work outfits to wear with your kicks!